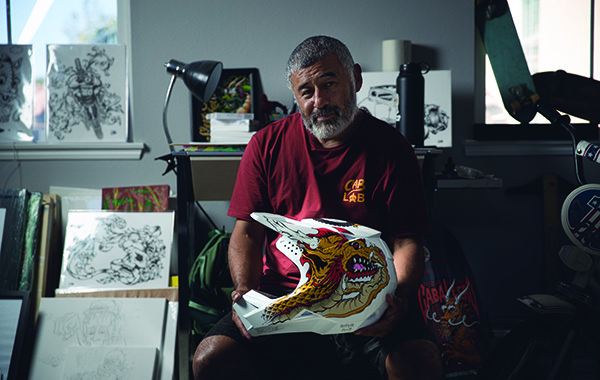 Steve Caballero – legendary skateboarder, artist, moto fan and most recently motocross gear designer. Grant Reynolds sits down with the man known as ‘Cab’. Steve Caballero is one of the most popular skateboarders of all time, an original member of the Bones Brigade, one of the most successful skateboard teams ever, featuring other skaters like Tony Hawk, Mike McGill, Rodney Mullen, Lance Mountain and Tommy Guerrero. He is Simply known as Cab. Thrasher magazine voted him Skater of the century in 1999 and Transworld magazine listed him as one of the most influential skaters of time, he is also famous for inventing the ‘Caballaerial” the first 360 on a halfpipe, while that seems like nothing today, at the time it was a vision of what else could be done on a ramp or bowl and also invented the front side board slide. Steve joined the bones brigade in 81 at the tender age of 12, hand picked by skate legend Stacey Peralta from the Zephyr competition team known as the Z-Boys. 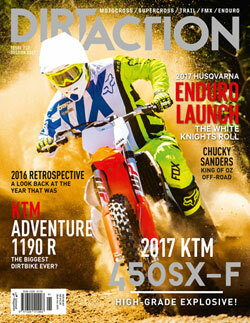 But apart from skateboarding, Cab has many other passions like music, art, motorcycles and cars but most in particular, Motocross and has played in many punk bands and still plays in The Faction. 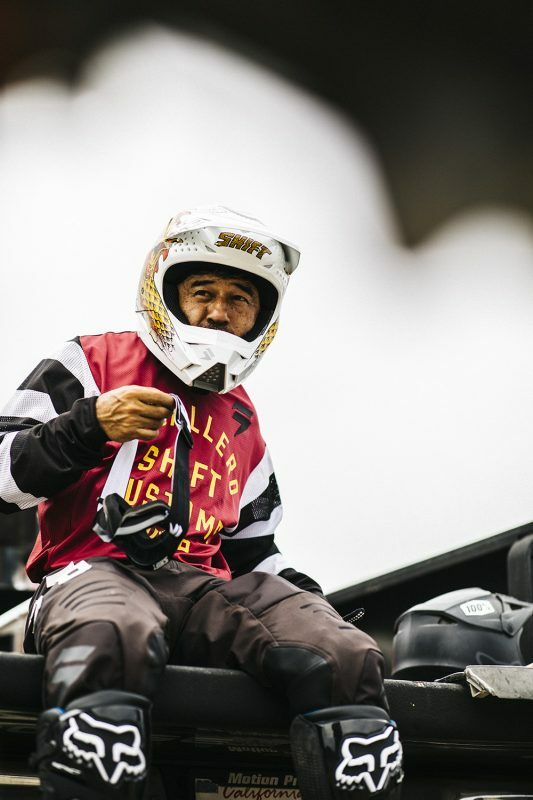 I’ve taken Cab riding a few times here in Australia when he is out for the Bowlarama event in Bondi and just recently I got to catch up with him at FOX Raceway in Pala for a ride and talk to him about his gear collaboration he did with Shift MX. 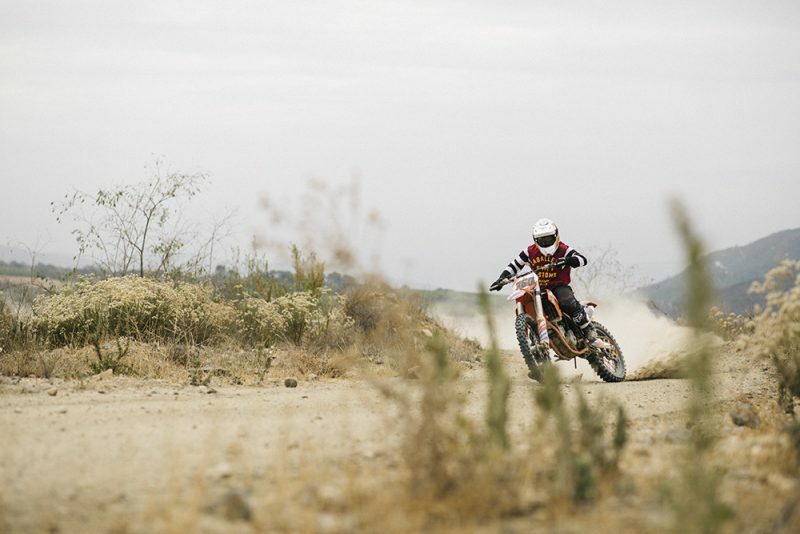 At 53 years old he’s very quick on a dirt bike. He is seriously one of the nicest guys out there, very humble in what he does and is always doing something, he’s never not busy. I feel very lucky as an 80’s skate rat to be able to call my childhood hero my friend. After some moto’s we went for a spa and got to sit down and chat with him about pretty much anything that’s not skate related, sometimes I think he likes that. You’ve been regarded as one of the most influential skateboarders of all time, how long have you been into bikes? I got my first dirt bike in 2001 and rode for about five years, and then I quit riding completely for six years, and got the bug again in 2011. I then bought a CRF250R and just started riding again and over the past few years it has really become more frequent you know, I’m right back into it. My buddies and I ride every Monday and we always try to get out once or twice more a week when we can, some weeks it works and others it doesn’t. I currently ride a 2015 KTM SX 350 and I’m loving it, just the right amount of power for me and I just upgraded the forks from a 2018 husky. I have always been into motorcycles I guess, I’ve had many road bikes since I was 17 but lately I’ve been loving dirt bikes. Tell us a little about this collaboration you did with Shift MX, how did that come about? Yeah, well I’ve always been friends with the people at FOX and ever since I got back into dirt bikes they have always supplied me with gear. Whenever I do special cross over races they always do some special gear for me with my name and number on it which is cool, so I’ve always kept this relationship with them and they’ve always been really supportive. I guess over the years Shift has made a significant shift in the industry and they’re trying to get a little more attention to their product and Shift has always been a sister company to FOX, it’s all in house and everybody kind of works on the same stuff in there. I’m friends with one of the designers Todd Cubby and he called me out of the blue one day, I guess he could see I had been riding a lot through my Instagram and I had been posting a lot of my art work as well and I guess they had been attracted to it. They had this idea to come out with a new line starting with an artist series, a special collaboration series to give a little more attention to the brand Shift. Todd called me and asked me if I’d be interested in designing a gear set. I was like ‘YEAH! For Shift?’, I don’t know, what do you want? how do you want to go about it? Yeah that must of been a good feeling? Yeah, it’s been pretty amazing this experience. It’s just really cool to share my passion for art work and motorcycles and have them combine with each other. 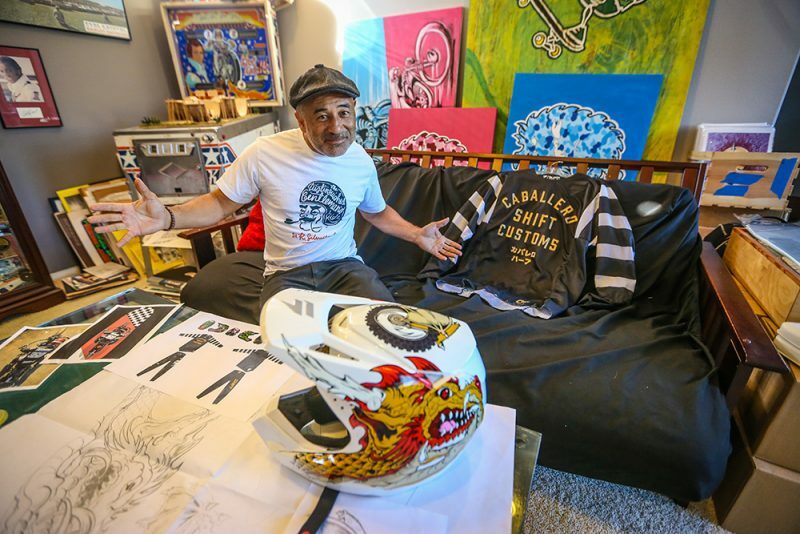 What’s next for Steve Caballero and Shift, anything else in the works? We haven’t really spoken about it. It has sold really well, but I wasn’t planning on continuing collaborating with them. If it ever came to the point where they want me to design more stuff for them, then yeah, I’d be down, but this is just the first collaboration. So, who knows, this could just be a one time deal, but all I know is I love the gear and I’ll just keep rocking it until something else pops up. You’re also very frequent on social media, especially on instagram, Do you see that as an important tool for celebrities and athletes like yourself? Yeah that’s awesome, well thanks for talking to us today Cab, keep ripping, keep inspiring and all the best for the future. (In a great Aussie accent) Yeah cheers mate!